Kevin Kasper's Southern California College team showed improvement in 1997, getting 18 wins by mid-March, according to The Los Angeles Times. For the second-year coach those wins marked a big turnaround from his first season, where his team only won 12 games all year, The Times wrote. "It's a big turnaround to go from 12 wins last season," Kasper told The Times. "It makes things a little more fun. Actually, it makes it a lot more fun." Kasper had that fun in his second career, one as a coach. In his first career as a player, he played five seasons, but the fun didn't extend to the majors. He never made AAA. 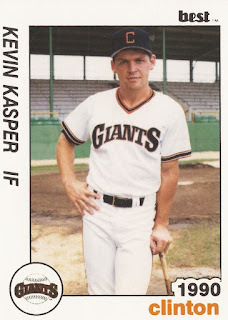 Kasper's playing career began in 1989, signed by the Giants as an amateur free agent out of Southern California College. At Southern California, Kasper picked up two hits, scored once and knocked in an RBI in a February 1989 game. With the Giants, Kasper started at short-season Everett. in 38 games that year, he hit .239. He knocked in 16. Kasper moved to single-A Clinton in 1990. He then played 1991 between Clinton, high-A San Jose and AA Shreveport. He hit .262 between them. He scored a run in a June game with Shreveport. He then split 1992 between San Jose and Shreveport. His final season came in 1993, with 65 games back at Shreveport. By June 1995, he was the head coach at Southern California College. He stayed with the school through 2004.